Founders | Beer Apprentice - Craft Beer News, Reviews, Interviews and Info. Hi guys. For today’s craft beer review I’m going to be trying the collaboration beer called LinchPin produced by the Green Flash Brewing Company situated in San Diego, California and the Founders Brewing Company located in Grand Rapids, Michigan. I found this commercial description of LinchPin from the Founders website, foundersbrewing.com. However, I think it was brewed at Green Flash, so be sure to check out greenflashbrew.com as well to see some of their other spectacular brews. “There’s a lot going on in this beer with two yeast strains, copious amounts of wheat malt, and a big focus on ‘C’ hops to deliver a citrus explosion,” explains Green Flash Brewmaster, Chuck Silva. “In fact we lined up more than a dozen hop varieties in the brewery to select three hops with the biggest citrus character to dry hop the beer. “This golden beer pours with beautiful, frothy white beer foam that lasts due to bottle conditioning. Gently rousing the yeast that settles in the bottle will result in a fuller texture and a more cloudy white appearance. The citrus aromas that jump from the glass are largely tangerine up front with other types of citrus notes that mingle with the Belgian yeast esters. Hop flavors of bitter orange zest dominate the brew and linger to the finish with a nice play of American and Belgian yeast combo.” A beer with so many components can be held together with a “Linchpin”. 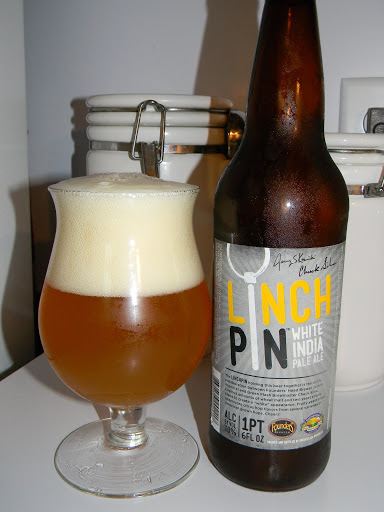 The official “Linchpin” of this beer is the skillful collaboration between the two breweries to create a unique hop-forward brew. Linchpins are symbolic: two simple shapes that combine to strengthen a bond amongst many different pieces. This beer came in a 22 oz. bottle and it had an ABV of 7.0%. It poured a hazy, yellow to pineapple juice color with a bright, white head. The texture was soft, sudsy, soapy and semi-rocky. It was sized greatly, the retention time was excellent and the lacing was patchy and cobwebby. The nose released some hints of grapefruit citrus, clean white bread and some floral notes. I also discovered some fresh grassiness, yeast and lemon along with a slight mineral fragrance. It seemed well balanced and pleasant to me. The mineral note was not all that distracting either. The taste had both the grapefruit and lemon citrus. Savors of grass and hay as well as the white breads and fresh floral tones. A very, very light peppery spice tickled on the back side too. The bitterness was nice, yet the hop bite seemed to be somewhat relaxed. The mouthfeel was medium bodied. Dry, crisp, refreshing and thirst quenching. The carbonation was good and not too lively. Only a minor amount of warmth was felt and a good deal of flavor was left behind after each gulp. Overall, I found this to be a very nice beer. This brew was released back in the Summer and I got to sample it during the late Summer/early Fall, but it probably would be best suited for the warmer weathered season. I doubt that I would turn it down no matter what the weather if it were offered however. The drinkability was outstanding. I absolutely killed this bottle in no time flat. I hope that they make this again at some point because it would easily be worth a try if you didn’t get the opportunity to grab a bottle. If you did have the chance to try the Green Flash/Founders LinchPin, be sure to leave a comment and tell me of your opinion. Did you guys like it? Would you want it to be brewed every year? Hello everyone. For today’s craft beer review I’m going to be trying the Frangelic Mountain Brown produced by the Founders Brewing Company located in Grand Rapids, Michigan. Most that have followed this blog know what a fan of Founders I am, so to have the opportunity to try this limited Backstage Release beer really excites me. 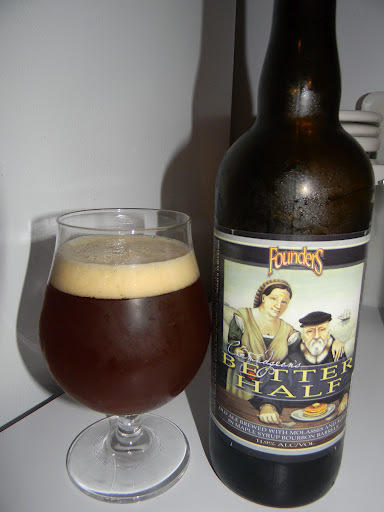 Let’s jump to the website, foundersbrewing.com, and see what they have to say about this beer. Frangelic Mountain Brown is the quintessential taproom “one-off” beer: Founders’ brewers created the Mountain Brown series for their taproom in Grand Rapids in 2007. Frangelic Mountain Brown is the 16th iteration in the series of popular brown ales—and it likely won’t be the last. The singular characteristic of this beer comes from the use of hazelnut coffees in the brewing process. The beer has distinct aromatics with sweet and nutty flavors beautifully balanced. Founders is known for its beers made with coffee (i.e., the Breakfast Stout series), but this is both the brewery’s first brown ale and its first beer brewed with hazelnut coffees to be bottled. This brew came in a 25.4 oz. bottle with an ABV of 9.0%. It poured dark brown with some ruby hues around the edges of the snifter. The head was light tan in color, smooth, soft and creamy. It had a near perfect size with some pretty impressive retention time and some very conspicuous lacing as well. This beer looked great in the glass. The nose released a nice shot of espresso, toasted malts and breads. Beautiful hints of roasted and toasted hazelnuts with a very, very slight touch of bittersweet chocolate. I really liked this fragrance. I thought it was bold, balanced fairly well and enjoyable. The taste had a lot more of the chocolate flavoring. Cocoa powder and savors of freshly baked brownies. It was sweet, but not overly sweet. Less coffee was found, but the hazelnut was there along with more of the toasted breads and a slight “leafy” profile. This taste was very malty, round with low bitterness and little to no alcohol. The very last sip reminded me of the last swallow of the chocolate milk I used to drink as a kid. The mouthfeel was a solid medium. Very, very dry, smooth and chewy with a medium to low carbonation. A decent amount of flavor was left behind, but not as much as I had hoped actually. Still not too bad though. Man, I really liked this beer. One of the better Browns I’ve had. It was chocked full of aroma and flavor and the drinkability was exceptional. I tried this back in the Fall and it totally hit the spot. I hope that Founders decides to make this again because I would definitely continue to pick it up. I’ve noticed that this beer has gotten some mixed reviews and I don’t know why that is. Maybe it’s because it didn’t get all of the publicity that some of the other Backstage beers got. Anyway, I don’t care. This is a great beer. I should have picked up two bottles. I hope that you guys had the opportunity to try the Founders Frangelic Mountain Brown. It was definitely a treat and one that I hope to get to try again.